Setting Minimum cart requirements is very important for the business. It ensures you that any customer from a specified discount group will be able to avail of the discount you offer for their purchases only if he has met the cart requirements that you have set. Step1. From the dashboard, choose a discount group by clicking on its Edit button. 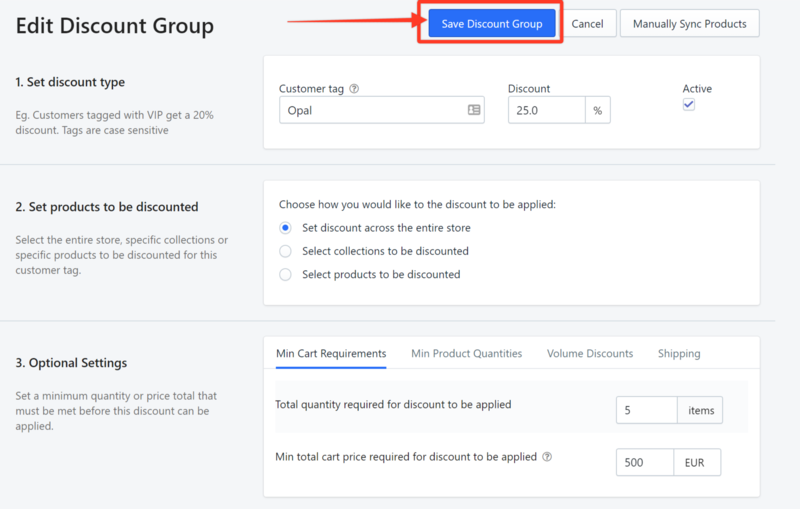 In this example, the discount group is named Opal. Step2. Scroll down to the Optional Settings section. Step3. Under Min Cart Requirements tab, set the total number of items you require for the discount to take effect in the first field. In this example, we enter 5. Step4. You can also enter a minimum total cart price for the discount in the second field. In this example, we enter 500. Step5. Click Save Discount Group. From this scenario, it shows that the customer will only be able to avail of the discount intended for the Discount Group where he belongs if he buys a minimum of 5 units/pieces of the product OR a total of 500 EUR of his purchases.